Most of us were able to sneak out of work early to pick up the trailered sleds & gear from Leisure Sports. 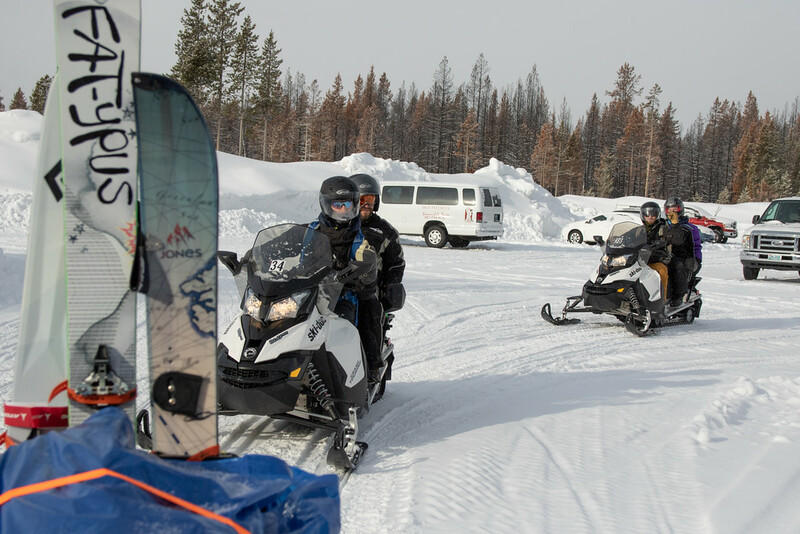 There is a lot of prep that goes into this trip, including taking the snowmobile self-guided course and arranging all the paperwork, rentals, etc. On the road by 6am, we stopped by Creekside (deli in Jackson) for the day’s sandwiches, and we then departed for Flagg Ranch. Between Jackson and Moran, we saw a large k9 cross. It was dark and large enough to be a wolf, but the snowbanks were so high and pre-sunrise, so didn’t get a good enough look. Arrived at Flagg Ranch around 8am. The unloading process and packing of the sled trailer sled took a while. We have discussed traveling lighter if we do this again. We usually have ski-touring people with us but might limit to snow shoes only to make packing easier. 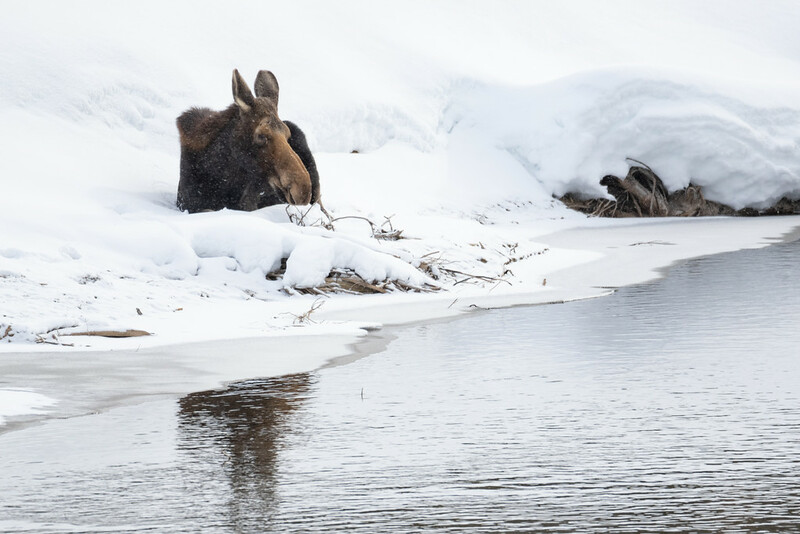 We were off to the south gate backcountry office by about 9:15, but not before spotting a moose on the river just south of the gate. The weather for the trip was mostly overcast with some wind/snow. It made it pretty easy to find recent tracks, which we did on a few occasions. We stopped at some of the typical pullouts along the south way, but most of it is pretty uneventful. 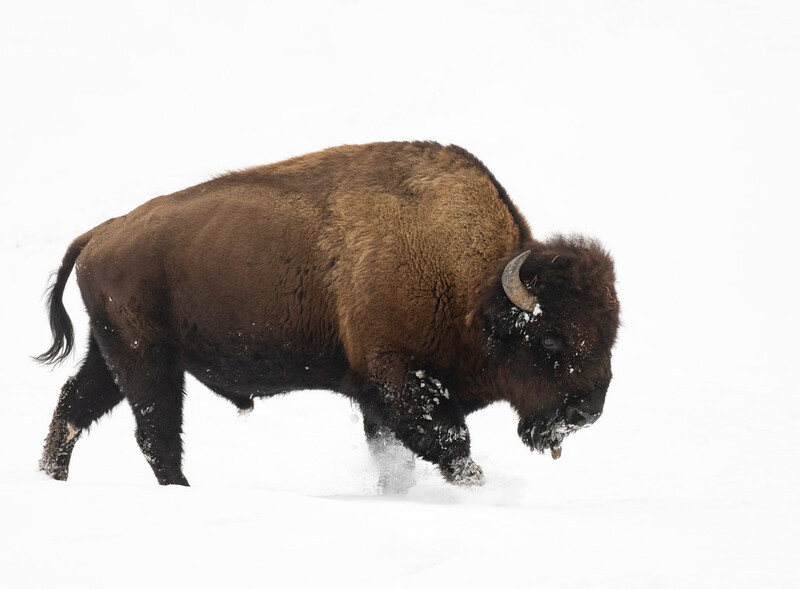 No bison encounters until Mud Volcano. Moving on to Hayden Valley, the wind really picked up. We were going to stop somewhere like Grizzly Overlook for lunch, but it was just too windy. So we pressed on to Canyon. They had most of the visitor center open with the ranger desk staffed and even picnic tables inside! It was a welcome sight with how cold we all were. After lunch, we decided to give Hayden Valley another try. The wind died down some, and we were a little more tolerant of it with full bellies. 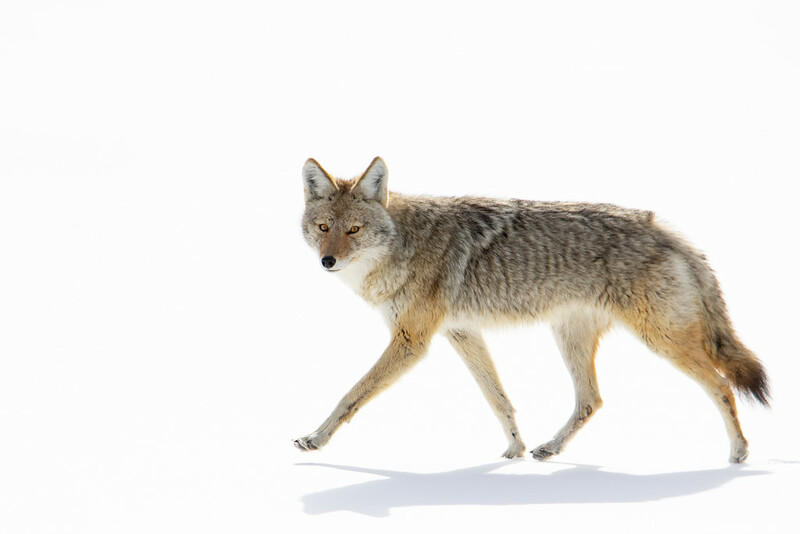 The valley had plenty of bison with the occasional fox. The fox were unfortunately too far out for pictures. Back towards Canyon, we stopped near the bridge to look for river otters. There were no slide tracks on the snow, and I was just about to give up until another member of the group spotted them. From there, we moved on to the various falls lookout points until almost dusk. Then it was back to Canyon to layer up and haul to West Yellowstone. We stayed at Three Bear Lodge that night. We picked up lunch at Ernie’s Deli and headed in from the west gate. On Riverside Drive, there was a bull elk carcass on the river, and we found fresh wolf prints in the area, but no (live) animals nearby. 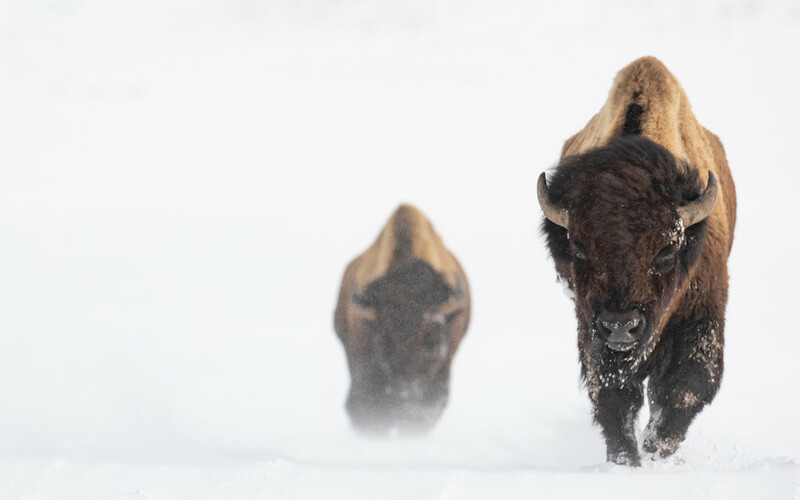 Moving on, there were plenty of bison, some elk at the 7-mi bridge, and the occasional eagle. Then we found a bison carcass in the river. This one had some more meat on it, but no wildlife activity. 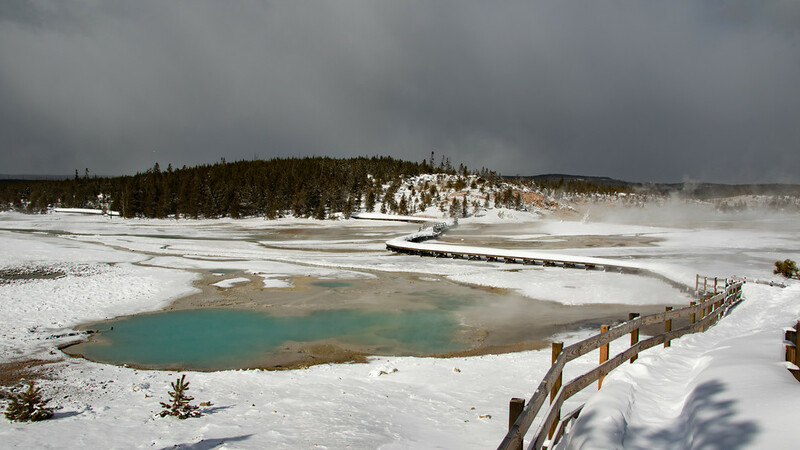 From Madison Junction, we backtracked up to Norris to see the geyser basin. The level of snow made many of the boardwalks impassible. Next it’s back to Madison for lunch in the warming hut, and then checking on that bison carcass. Nothing new this time. 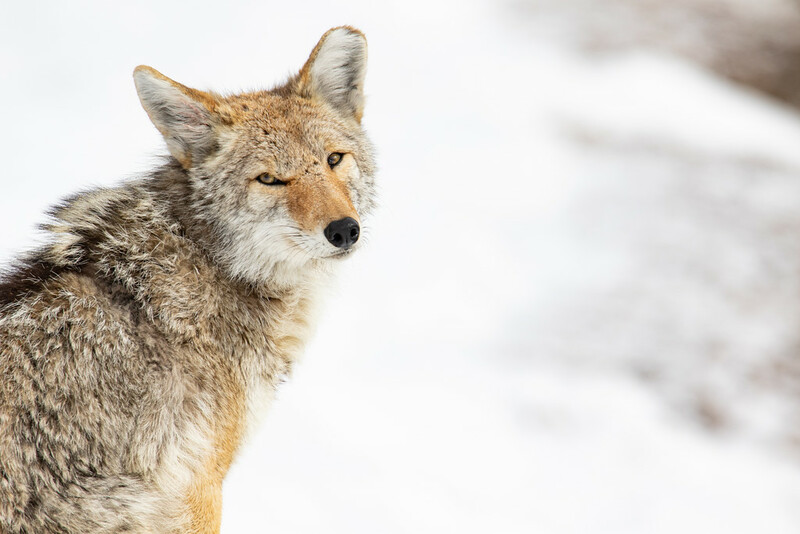 The most recent wildlife sightings that were reported in the park were the Canyon wolves near Fountain Flats. 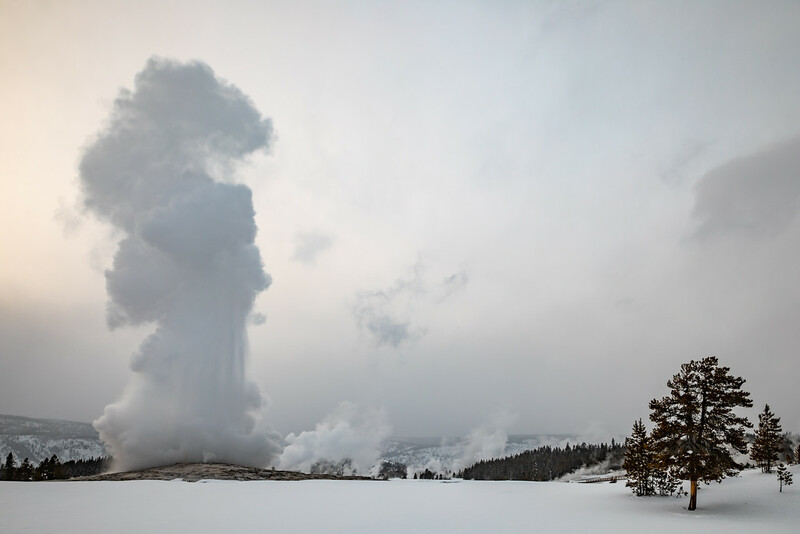 So we decided to hang around there for the afternoon and checkout the other geyser basins while we were there. The weather was pretty poor – overcast with wind. Walking the boardwalk around the Grand Prismatic covered us and our gear in a layer of ice. That night we stayed at an OF Snow Lodge Cabin. The lighting was flat and gray, but OF is still neat to watch, especially in the absence of crowds. We had breakfast at the snow lodge and grabbed lunch to go. The goal for the morning was to hit the Fountain Flats area looking for the Canyons. If we made it up to Madison, there was also that bison carcass. Near Fountain Flats, we found multiple sets of wolf tracks both along the side of the road, and some that went down Fountain Flats Drive. No actual wildlife was found besides bison. Lunch at Madison again, then there were some coyotes around the bison carcass. Not sure if they were there for the food source because they never made an attempt at it. And it doesn’t seem to be because they were shy either. This is our last day, so we need to exit the south gate. It’s time to start heading that way. We passed Firehole Canyon drive and made it a couple miles north of Fountain Flats. 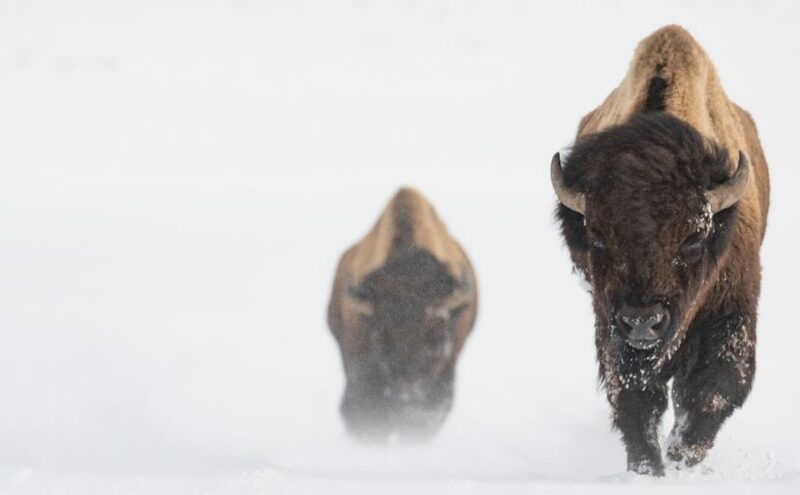 There was a herd of bison in the middle of the road, and a snowcoach was trying to move them along. They were being especially stubborn though, clustered tightly in the middle of the road. 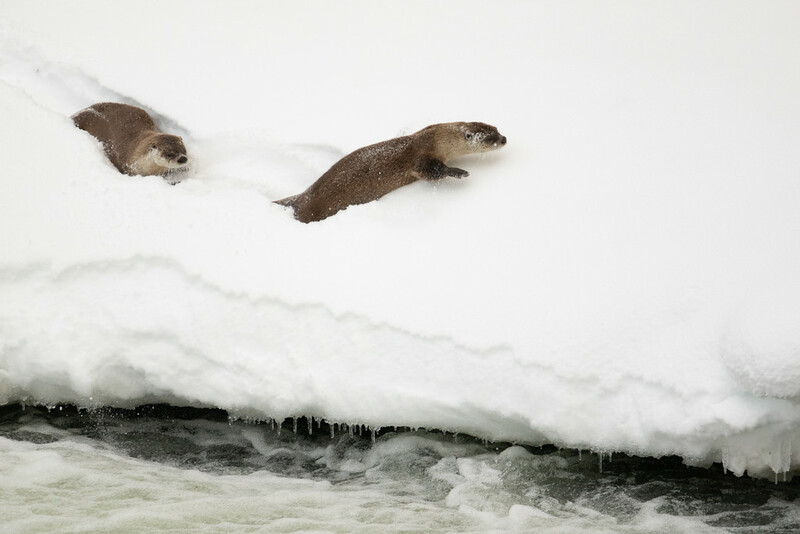 That’s when the driver of my sled spotted them. At least two wolves back in the trees. 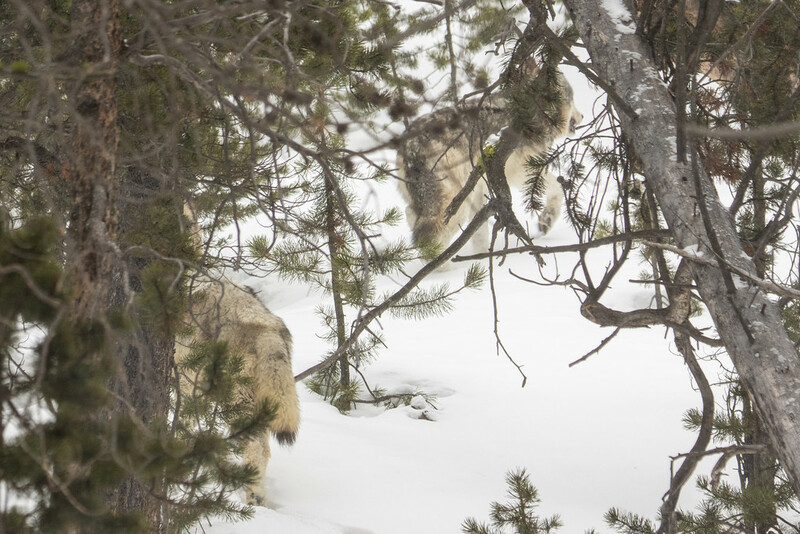 There was quite the northbound buildup of tour groups from the bison, and it seemed to be too much for the wolves, because they peeked out for a second, and then retreated back into the trees. So after they retreated, we moved further down the road and waited for the tour groups to leave. The bison stayed put and continue to stare into the trees. Not sure if they still had a visual of movement of just smelled them. In either case, they never came back, so we continued to push south. After dark, we only have to share the roads with the groomers. One of the groomers stopped us and stated we were out too late (7:30pm). Non-commercial groups can actually be out on the roads until 9pm. But many people don’t know that. It’s not uncommon for us to be stopped, reported, called in, etc. That’s why I always make it clear to the group that we do this trip by the rules – period. If there is bison in the road, we wait. Let the commercial groups push them along because the non-commercial groups seems to be scrutinized more. This groomer seemed genuinely concerned though that we were out so late, and rightfully so. The south gate of the park is pretty remote, and if we had a breakdown, a trail groomer might be the last person we would see until morning. But there was thankfully no breakdown, we were back in Jackson by 9pm.